This document describes the kinds of rules that apply to documents. "DELETE" Prevents the document from being created. DWSpecificationId Creates a new Word document with the specification number used for the file name - for example, "Cover Letter.doc" would become "1.doc" if it was generated by the first specification. DWSpecificationId&".rtf" Creates a new Rich Text format document with the specification number used for the file name - for example, "Cover Letter.doc" would become "1.rtf" if it was generated by the first specification. See File types table below for all file types that can be created from a Word document. DWSpecificationId&".Cover Letter.doc" Creates a new Word document with the specification number and .Cover Letter used for the file name - for example, "Cover Letter.doc" would become "1.Cover Letter.doc" if it was generated by the first specification. When using "." in the naming of a document the file type extension must always be included. If the file extension is excluded the file type of the document will take the name of any text included after the "." The file types that are available depends on the version of Microsoft Word installed on the machine that is generating the document. To produce the document in a file type that requires additional configuration options (such as .pdf) consider using the ability of DriveWorks to automatically run a macro on a document see How To: Create A Macro To Run On A Document for more information. 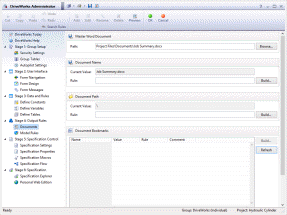 The document path rule controls the folder that the document is created in. If the folder specified by the Document Path Rule does not exist it will be created by DriveWorks when the document is created.
"" If the rule is blank the document will be created in the Specification Path which is applied in the Specification Settings. "\Documents" If the Specification Path is set to "C:\DriveWorksPro\"&DWSpecificationID the document will be created in the C:\DriveWorksPro\1\Documents folder if it was generated by the first specification. All named ranges and cells are displayed in the Named Ranges window. Current values of any named ranges will be restored in the new document unless a rule is applied. "To " & ContactNameReturn Results in To John Doe if the value in the form control ContactName equals John Doe. DWCurrentUserName Reports the name of the person logged into DriveWorks as defined in Security Settings. Portable Document Format (PDF) files can be created, by default, for documents based on Microsoft® Word and Excel files. When a Microsoft Word or Excel document is created or edited, the options for the additional formats to be created are listed under General Settings. To create the additional format check the box in the Create Document column. To prevent the document file type from displaying in the Specification Explorer check the box in the Hide From Document List column.